Freaking amazing. I love Daredevil comics, pretty much everything from Frank Miller's tenure as writer through to the recent End of Days epic, there exists a coherent story of a man trying to do the best he can to save his dying neighbourhood from poverty, crime and corruption. Like all comics, there are weak patches, but I feel that overall, it is an almost unparralled run of quality comics. I even enjoy the Ben Afflec movie because it was, until recently, the best live-action representation of the character I like so much. So, Netflix Daredevil, pretty damn awesome, get your 30 free trial on and binge it out over a weekend. Also D'Onofrio is a brilliantly sinister and physically imposing Kingpin with a great subtle fragility that humanises the character. Where the Fox Daredevil film was sleek and polished in the Hollywood tradition, despite the gritty and noir overtones of the source material, Netflix Daredevil is thoroughly contemporary look at Matt Murdock that shows a New York that it still to come to grips with a world populated by Norse Gods and Super Soldiers. Unlike Agents of SHIELD or Arrow, the cast of Daredevil don't look like off-duty underwear models, Elden Henson is a wonderfully ugly Foggy Nelson and even Charlie Cox (Matt) is scuffed up and bruised more often than not. If Daredevil is indicative of what's to come with the Netflix MCU tie-ins, I'm pretty excited. Jessica Jones, Luke Cage, Misty Knight, Iron Fist and the Punisher are all set to break into the MCU in a big way. I can't wait for SLJ Fury to send Frank on a mission to rescue a small Russian girl. Hell, in a year or two we're all set for Secret War as a film or TV mini-series. As Fury said "This is how you teach them." Deadman, Freddy Kruger, Catwoman and Devil Dinosaur. All Clix except for Devil, who is a D&D Miniature. Detail on Devil Dino. It was really fun to paint a big mini from scratch. Close-up of two dead men, one hero and one villain. Catwoman. A bit plain to paint, so her goggles actually have 5 colours on them! Let the corruption begin! Last night I got Fuzzy (see the "Little Lead Men of Valour" link to the right) into a game of SS4 with a couple of my small teams. The scenario was The Rescue with The European Union Super Soldiers (played by me) defending the buxom newsgirl from USAwesome in a classic hero team "misunderstanding". The game was played on my WIP Empire of the Dead Necropolis table as a game of EOTD had just finished. Saladin, Victoria and Richard the Lionheart guard the defenseless woman. ...whilst The Frontier Spirit goes for a flanking maneuver. The Second Amendment opens fire, with little effect. Saladin makes a charge for McHero, not wanting to be on the receiving end of his powerful bulk. Victoria closes in to negate The Second Amendment's ranged superioity. The Frontier Spirit wounds Richard the Lionheart with a crack shot of his ghostly six-shooter. Richard and the prisoner take cover behind the church. The Second Amendment is no match for Victoria's flashing blade. The appointed defenders of Turkey and Italy stare down the product of Fast Food and Political Pressure Groups. The combined might of Saladin and Victoria is not enough to so much as scratch McHero. McHero injures Victoria gravely, but the rescue chopper has arrived and the game ends in victory for the European Union Super Soldiers. A fun little game to introduce the basic concepts for a new player, I really want to bump some of the teams up to five members to get some real comic book action going! So I saw that Megamind was on television the other night, and I figured that it wouldn't hurt to record it and give it a watch. I vaguely remember hearing from someone that it wasn't that good, so I went in with low expectations. Turns out Megamind is pretty damn amazing. 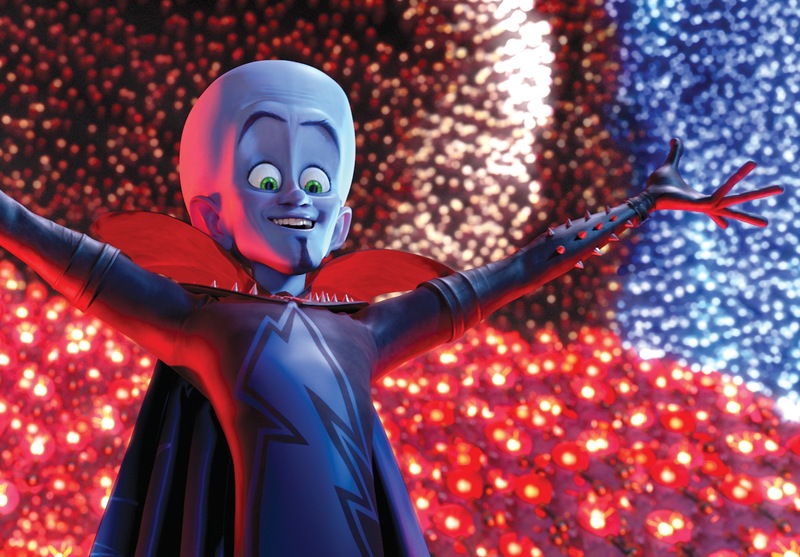 Starting with a very "Superman" opening (last son of a dying planet, sent to earth), Megamind quickly sets up a somewhat cookie-cutter supervillain origin and dives right into the action. Actually, before I get too far ahead, the nods to the classic Donner Superman and silver-age Supes in general are really well done and perhaps make the film worth checking out for Superman fans just for those notes alone. Also, though the origin story is quick, it does cover the ideas of Hero/Villain rivalry really well. I'll note as well, that Megamind really knows how to make an entrance, which as a fan of Doctor Doom, I really appreciate. So it's no The Incredibles, but Megamind playes with some great concepts that I love to see in superheroes; reversal of hero and villain roles, a hero retiring and a Villain being forced to defend the same people they once terrorized. The offsets to this are the usual Hollywood cliches like love being the answer and Disney fake-out deaths, but I guess I'm getting used to that kind of thing and just mentally gloss over it. Man I can't wait until Bollywood, England and Hong Kong start making superhero films. Ok, so I won't be running out to find a 28mm Megamind, but if I see the DVD cheap, I'll be sure to grab it. What I have gained most from the film is some inspiration for scenarios and hero backgrounds to flesh out my games and settings. It's always good to find a film enjoyable when I'm not expecting much and David Cross is always good value, even when the audience is too young for him making jokes about having "blue myself early". That's all I have for the moment, if I find any more, I'll be sure to post them.